Great Plains Trail Wildlife Checklist is here! As you're driving in western Oklahoma, visiting great destinations, taking in awe-inspiring landscapes and watching wildlife, wouldn't it be fantastic to have a small publication- a checklist, that lets you know what wildlife might be found in the different seasons, along the loops of the Great Plains Trail? The Great Plains Trail of Oklahoma is a series of 13 driving loops, each full of nature tourism opportunities and rich in historical and cultural heritage that tells the story of the American Great Plains. From prairie chickens to horny toads, scissor-tail flycatchers to elk, the public and private lands of western Oklahoma are home to a diversity of unique and interesting wildlife species. The Great Plains Trail of Oklahoma showcases the small-town hospitality and rich cultural and environmental heritage of the region. The trail is a highway-based, wildlife viewing trail that spans the entire western portion of the state while attracting visitors to wildlife destinations within the states of Texas, Oklahoma and Kansas. From its strong Native American heritage to its natural icons like the Wichita Mountains, Black Kettle National Grasslands, the Black Mesa, Little Sahara, Alabaster Caverns and The Great Salt Plains, western Oklahoma exhibits a sense of American history that has all but vanished elsewhere in the country. (Visit the Great Plains Trail section for more detailed information). OWPHA purchased the Gate Lake Playa (across from the No Man's Land Marker) on US HWY 64 on the Beaver County/Harper County Line with grant funds from the North American Wetlands Council. This playa is just under, 70 acres in size. The Playa was assessed to determine if it could be enrolled in WRP. Culvert removal. The culvert under the county road was blocked off. It needs to be removed to enhance water flow. Seed with what is there, mixed grasses: switchgrass, sand blue, etc. 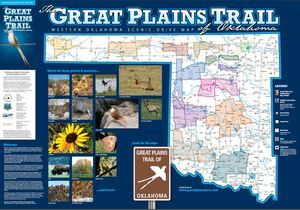 These collectible cards showcase Icon Species for the various loops of the Great Plains Trail. The front of the cards feature a photo of the bird. While the back has information such as size and a short description of the bird; what it eats and when it can be found in Oklahoma. These cards will be handed out at Wildlife Expo and other OWPHA / GPT trail events. Participants received a messenger bag containing: a variety of field guides & a binder full of good information plus much more! Due to limited seating, attendance was limited to the first 60 destinations that sent in a RSVP. OWPHA knows the number one killer of the adult Lesser Prairie Chicken (LPC) is fences. At the Lesser Prairie Chicken - Ranch Conversation III, OWPHA agreed to do fence marking to help lessen the number of LPC killed. Following that meeting, Sutton Avian said if OWPHA would make contact with the producer to get permission to come onto the land to put on the fence markers, Sutton would pay for the materials and would do the physical work of attaching the markers to the fence so long as they have the funds. The markers are white and made of something like PVC pipe. They are about 2 inches by 3 inches and clamp onto the wire. 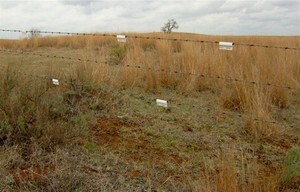 The research shows two wires need to have markers and there needs to be about 3 markers between each fence post. Whether you do or do not have LPC on your property is immaterial. All fences need to be marked, whether exterior fences or cross fences. OWPHA helped Sutton Research Teams make contact with interested landowners. 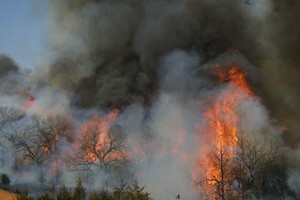 On November 13, 2007 also at the South Canadian Neighbors Community Center in Camargo, Oklahoma OWPHA cohosted a Burn meeting with the Nature Conservancy. This fall meeting had classroom sessions and was followed by the above "Field Day". The hot June breeze waves across the ripened field of wheat. Harvest time is here and a John Deere combine creeps through the bumper wheat crop. As the reel pushes the standing wheat into the header, all comes to a sudden stand still and the combine is quickly reversed. Water is standing in the field. Spring rains yield bumper crops, but excess water is left standing in low farmland areas. This has been the battle of many farmers in the high plains region. They are fighting against the natural playas and wetlands that are being farmed. The same is true for a handful of Beaver County farmers in the Oklahoma panhandle. I've farmed that bottom for 30 years and can count on one hand the number of years it was productive says one landowner. During one wet summer I was able to take the boat out and ski, says another. And as a kid I can remember when wildlife and waterfowl would flourish in that Playa. T his area's unique nature includes a big basin and several individual playas, all of which work together in the cycle of hydrology and wildlife. Playa Lakes are shallow, usually round, wetlands with a clay floor that lie in the lowest point which is a generally large, closed watershed and collects rainfall and associated runoff from surrounding uplands. 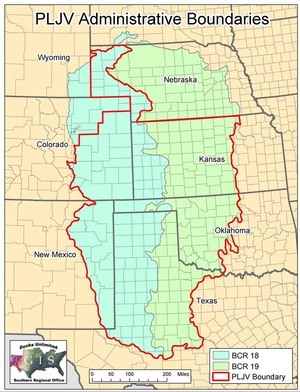 They are vital to recharging the Ogallala Aquifer. Since about 99 percent of playa lakes are located on private land, this information is crucial for farmers, ranchers and natural resource managers who desire to conserve water and maintain agricultural economies of the region. Conservation practices used to protect playa lakes include establishing native grass buffers around perimeters to filter out soil and agricultural contaminants present in the runoff and filling in man-made pits so water can reach the entire basin and all recharge pores. In rangelands, playas can be fenced off to prevent excess trampling or denuding of vegetation by livestock. Several programs are available to private landowners wanting to protect playa lakes. The above mentioned landowners near Gate, Oklahoma are working together to do just that. They are restoring important lands in favor of waterfowl, shorebird, numerous other wildlife as well as adding water recharge back into the Ogallala Aquifer. These actions are totally opposite from farming, but hold the satisfaction that future generations will be able to enjoy the same experiences of nature's unique features.